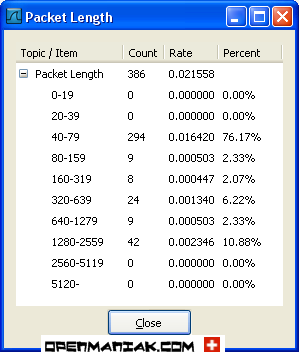 Wireshark provides a lot of different statistics which can be consulted if you click on the "statistics" field on the top of the screen. 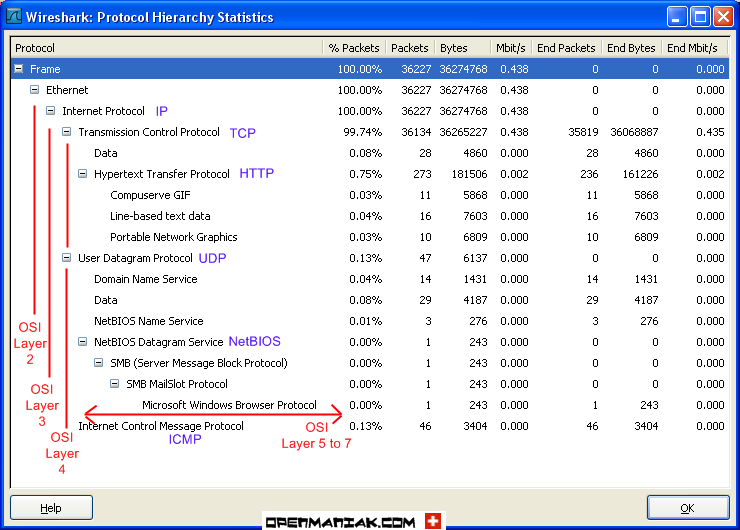 The protocol hierarchy shows a dissection per OSI layer of the displayed data. If you use TCP/IP suite application or protocol, you should find four active tabs for Ethernet, IP, TCP and UDP conversations. A "conversation" represents the traffic between two hosts. The number in the tab after the protocol indicates the number of conversations. For instance: "Ethernet:6". 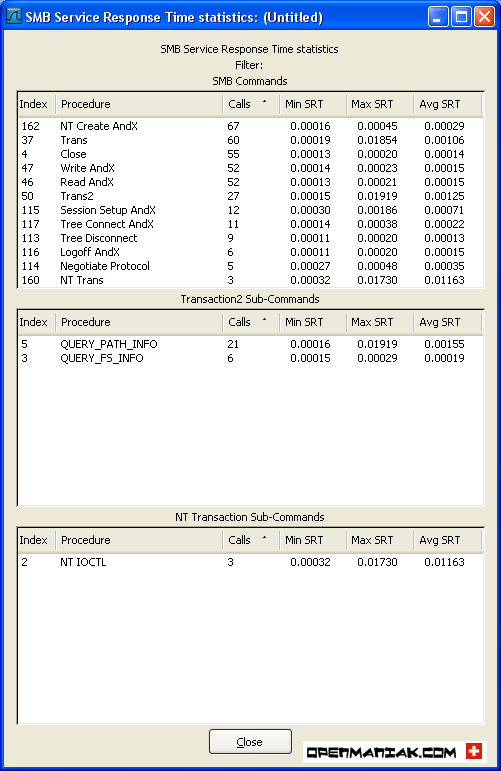 The endpoints provide statistics about received and transmitted data on a per machine base. The number after the protocol indicates the number of endpoints. For instance: "Ethernet:6". Basic graphics can be obtained under the "IO graphs" section. 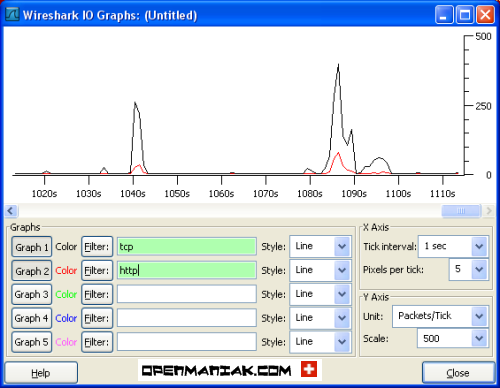 Multiple graphics can be added in the same window on a per display filter base. In our example below, we chose to draw two graphs depending on a "tcp" and "http" display filter. The "Conversation List" section provides the same information as the one given by the "Conversations" section. The "Endpoint list" section provides the same information as the one given by the "Endpoints" section. 13 protocols are available for an in-depth inspection. In our example we chose SMB (Server Message Block) which runs on top of the NetBIOS protocol (see Protocol Hierarchy screenshot) and is typically used when files are shared on a Local Microsoft Windows environment. 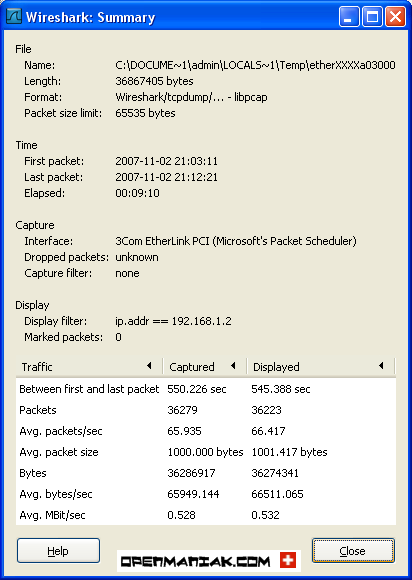 The Wireshark display filter is shown in the smb filter field. In our example, we have no display filter. It is frequently used in conjunction with SIP or H.323 which provide the signaling tasks. SIP (Session Initiation Protocol, RFC 3261) is a signaling protocol for establishing VoIP or video sessions. It works typically with the RTP protocol which is used to transmit multimedia data. The "Destinations" section shows all the destination IP addresses of the network packets. 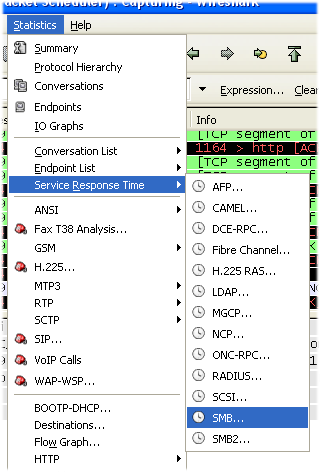 The "Flow Graph" section provides a sequential analysis of TCP connections. In our example, we created a displayed filter to target only traffic to the openmaniak.com website. The three first lines show a TCP connection establishment with the "SYN", "SYN ACK" and "ACK" sequences. HTTP (Hypertext Transfer Protocol) is a client-server communication protocol used to transfer HTML files. An HTTP client, most of the time a web browser, sends an HTTP request to a web server with the well-known "URL" field to locate the file. The web server will answer with an HTTP response and provides to the client the desired web page. In our example, we created a displayed filter to target only trafic to the openmaniak.com website. 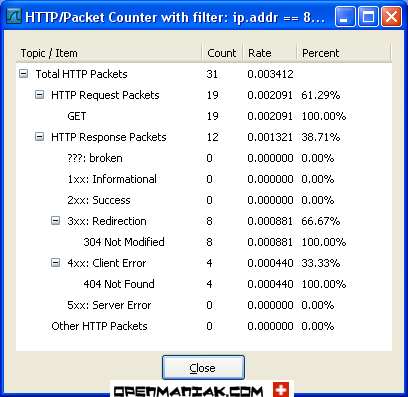 Display the HTTP requests and responses. Display the files consulted on the web server. Display the source or destination IP address of the network packets. 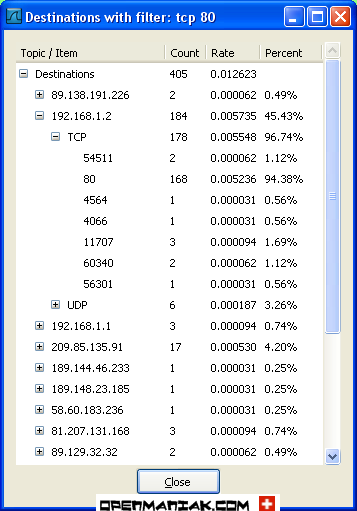 Display TCP or UDP ports statistics.